How can we ensure that everyone finds their way around easily in a care and retirement home? Sign up now for the online Frontwork newsletter and keep up to date. Customers, clients or visitors: they all want to get to where they’re going as quickly as possible. The direct route can even save lives in institutions such as hospitals. 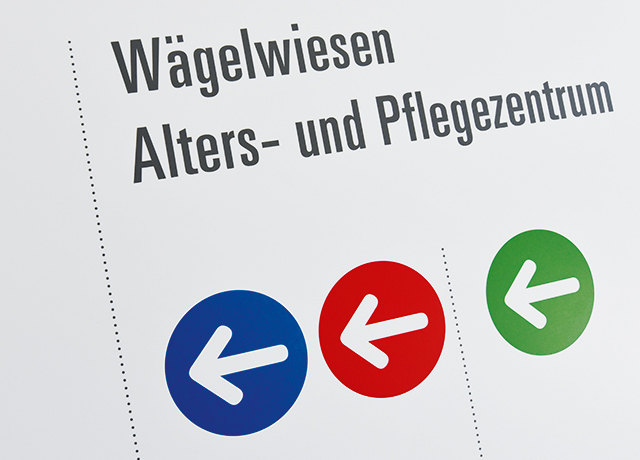 A structured signage concept enables you to create clarity and provide orientation. What is more, you emphasize the professionalism of your institution or your company both in internal and external areas. From the creative idea to professional implementation – everything from a single source. Clear signage at the right place aids wayfinding and is also part of professional corporate communication. We produce individual signage solutions for internal and external areas which meet the requirements of your building and location. Discover some of our most impressive solutions. We look forward to every project which we can successfully implement together with our customers. If we need signage or the inscription of our company premises and vehicles, everything is available from one source of supply at Frontwork. Easy, quick and uncomplicated. Our business relationship has proved its worth time and time again in every project. The specialists from Frontwork have the complete range of signage firmly in their grasp, in sun and rain, inside and outside. They installed a large number of sign-posting elements on a vast area. Once again Frontwork proved to be a reliable partner with high requirements for mutual success, which is not easy to achieve. It can only be accomplished by those who the keep an eye on the bigger picture and look beyond the short-term goals. Frontwork is part of this small group of companies. I would like to say a big thank you for the professionalism, support, passion and the invariably positive attitude with regard to our objectives. Do you have a challenging project? Ask Frontwork - they can do it! We would not hesitate to recommend Frontwork. The execution of the multifaceted order was creative, efficient and highly professional. The communication with the various departments was always solution-oriented, expert and very friendly. Our recipe for success is teamwork. In order to be able to put your ideas and our ideas into effect, we employ people from various trades and professions: polygraphs, graphic designers, advertising designers, carpenters and joiners, model builders, precision engineers, electrical fitters and many more. They all work hand in hand under one roof. They impress our customers with their versatility, willingness to work hard and their passion. When can they impress you? Would you like to become a Frontworker? Our team does a great job. More than 60 employees from different trades and professions work for us. We are passionately committed to the projects of our customers. If you would also like to work for Frontwork, send us your CV for consideration. We look forward to hearing from you!